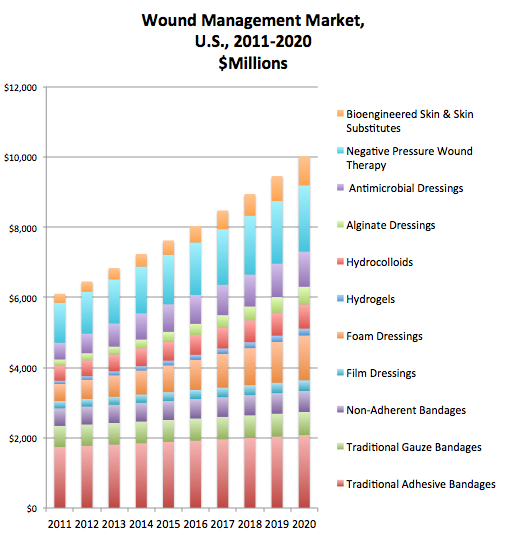 Wound management is about as diverse a market as there can be in medtech. 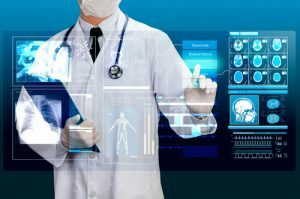 Wounds can be acute or chronic, surgically created or arising from trauma or disease, treated with technology as simple as a piece of gauze or as complex as a hyperbaric oxygen chamber or negative pressure would therapy technology. 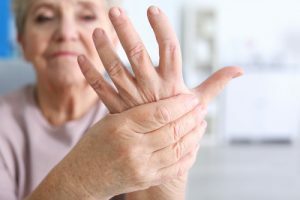 The manufacturers range from producers of largely commodity-like dressings to devices to equipment to growth factors and other biotech products. 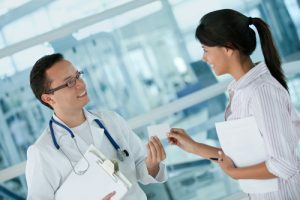 Simultaneously, the nature of patient populations, clinical practices, market development, economics and technology adoption vary widely around the world, resulting in considerable variation in the sales of traditional products all the way up through the most advanced products in wound management. 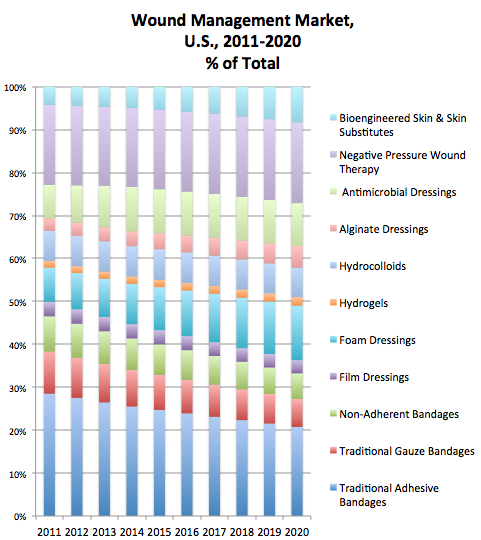 As an example, below are illustrations of the 2011 to 2020 forecast for the range of wound management products in the U.S. and a different set of markets, the Rest of Asia/Pacific (excluding Japan and Korea); predominantly China, India and Australia. 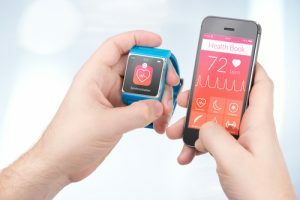 The U.S. graph illustrates the decreasing/increasing share of each technology’s sales relative to all others. 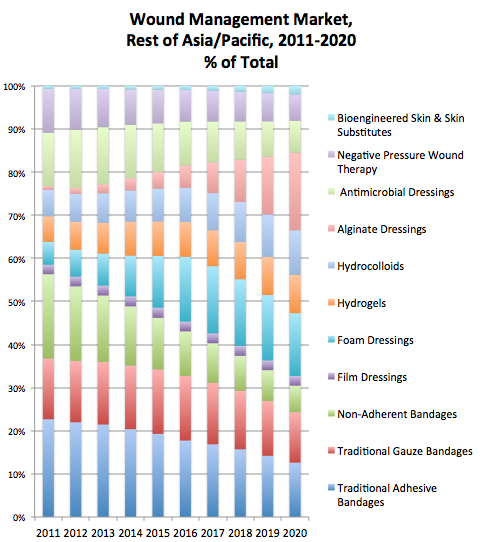 For the Rest of Asia/Pacific Market, a different picture emerges, with interesting variations per product segment. 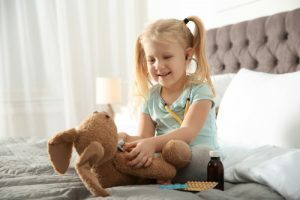 However, to put the relative differences into a meaningful context, one has to look at the absolute sales in the different markets. 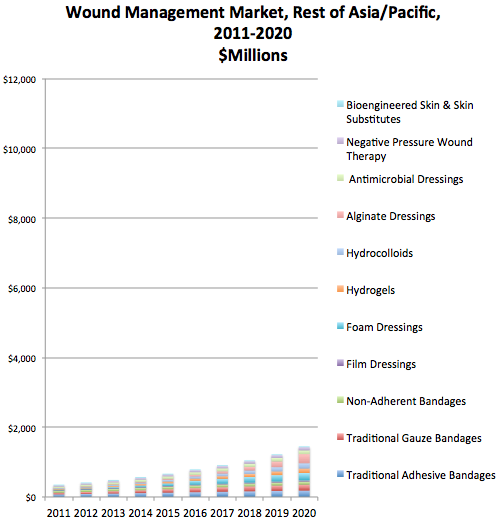 And, to show the very real, stark difference between the U.S. and Rest of Asia/Pacific markets for wound management products, we have plotted both on the same scale, with the max given for both as $12,000 million in sales.